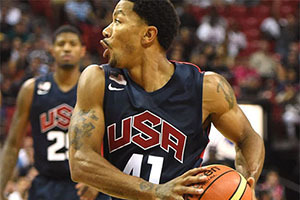 The build up to the 2014 FIBA Basketball World Cup continues apace and Team USA have whittled their training camp squad down to the 16 finalists. This is not the final squad, there are still some cuts to be made, but this will provide us with a greater idea of the players that will be carrying the hopes and dreams of the US nation in Spain this summer. Obviously the loss of Paul George with an injury has had an impact on the makeup of the overall squad, but there are other factors that been influenced the final 16 players that have been selected. Head coach Mike Krzyzewski and managing director Jerry Colangelo have announced the final 16 with just over a week before training gets underway again. These players will be heading to Chicago from the 14th of August where they will undertake their final preparations in the build up to the big tournament. There will then be a game against a Brazilian team before the squad is cut down to the 12 players that will make up Team USA in Europe this summer. Even without the final Team USA squad being announced, the team is by far the favourites in the betting market for the 2014 FIBA World Cup, and there is a chance to place bets in the market now. While there are still 4 players to drop out before the squad is finalised, there is an opportunity for every player to play their way into the big summer event, at least this is what the head coach is saying. Clearly there will be players that are guaranteed their space barring injury, serious loss of form or no longer being bothered with the event, but there will likely be some space for some players to jump in and make a name for themselves. Given that Paul; George was a name that many people felt was definitely included in the main squad, it is easy to see that this has freed up a space for someone to come in and make a name for themselves. Players that missed out, alongside George, include Paul Millsap, Bradley Beal and John Wall. All of these omissions will generate some debate but there is no doubt that plenty of fans expected John Wall to be in the squad, especially when you think about the success he has achieved with the Washington Wizards of late.